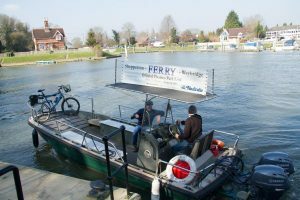 The Nauticalia Ferry continues a service that has operated from this point for around 500 years, and enables people walking or cycling the Thames Path to continue their journey past Shepperton Lock without being diverted by the Wey Navigation. The ferry runs every 15 minutes and you should ring the bell on the quarter hour if coming from the south (Weybridge) side to ensure the ferryman knows you are waiting. The bell on the Weybridge side is located at the bottom of the quayside steps. The Nauticalia Ferry continues a service that has operated from Shepperton for around 500 years, and enables people walking or cycling the Thames Path to continue their journey past Shepperton Lock without being diverted by the Wey Navigation. An ancient ferry is documented as being operated by Shepperton Manor in the fourteenth century, running from what is now Church Square in Shepperton to land on the Surrey side of the river (now Desborough Island, formed in 1935 when a channel was made to cut out meanders in the river). It appears that the ferry was well-used and, in 1614, the construction of St Nicholas Church further developed the Church Square site. In 1813 Shepperton Lock was opened by the City of London, who appointed the first lock keeper – William Hatch. Hatch began a service ferrying the boat horses across the Thames – at Shepperton, the towpath switches to the opposite bank. William Dowton, operator of the existing Church Square Ferry complained suffering a loss of income, and Hatch was told to desist. By 1820, Hatch was once again operating a ferry at Shepperton Lock, and was subject to further complaint. However, George Winch (of an influential family of barge owners) intervened, citing that the barges would be delayed if the horses were forced to make the long journey via Church Square. It was agreed that Hatch could continue as long as he took only the boat horses and no passengers. Records indicate that he remained in his employment until pensioned off in 1859 after serving 46 years as lock keeper. Further complaints were made in 1861 that the lock ferry was again taking passengers, and in 1863 a petition was made to relocate the Shepperton ferry to the lock. The Thames Conservancy agreed, and the parish road was made up as Ferry Lane. As it happens, a church ferry did continue until the mid-1950s. Shepperton famously features in H G Wells’ The War of the Worlds (1898) where he describes the battle with the Martians who attacked people trying to escape across the ferry. In the 1920s, George Dunton owned the boatyard by Shepperton Lock, offering boat hire and a riverside café, and operating the ferry until around 1960 when the service ceased. Proposals were made to construct a foot bridge to Weybridge, but they came to nothing. Nauticalia acquired the George Dunton business and boatyard in 1986, having moved from Shepperton High Street to Ferry Lane, where our Head Office, shop, and boatyard are based today. The Nauticalia Ferry now runs every 15 minutes on request and is a recognised part of the official Thames Path.